Ron Howard's Frost/Nixon, based on Peter Morgan's Tony and Drama Desk Award-winning play of the same name, is a thrilling look into the moment some 30 years ago when a real-life David battled a quite literal Goliath and came out on top, much to the surprise of a thankful American public. In this case, I'm speaking of a series of interviews conducted by British television personality David Frost (Michael Sheen), who put all he had on the line in 1977 when he crossed the pond and challenged Richard Nixon (Frank Langella) to a verbal duel, in which Frost's top priority was to get the former U.S. President to admit involvement in the Watergate scandal. Undoubtedly dramatized, the events play out curiously well for a Hollywood movie adaptation. I mean, who doesn't enjoy seeing little guys take down the big dogs? If this weren't true, think of all the sports movies – Hoosiers, Miracle, in a way Cool Runnings – that would've failed to break out had audiences not craved to see the long shot discover unexpected success. Here, we've got one particular brand of loser who lands the interview of a lifetime when Frost outbids the likes of CBS to speak with Nixon. And because of his entertainment TV background, Nixon's people saw the project as an easy way for the former President to pocket a cool $600,000, while at the same time reassemble his tattered public image. Following the typical sports model, things don't start out so rosy. Frost opts to throw a few hardballs at Nixon right from the start, which Nixon quickly brushes off without much effort. 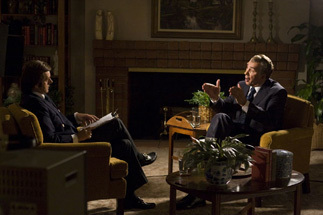 An intimidating force, and with total control of the interview, Nixon proceeds to talk about whatever he wishes (and at great length), leading Frost and his team of investigators – John Birt (Matthew Macfadyen), Bob Zelnick (Oliver Platt) and James Reston Jr. (Sam Rockwell) – to seriously reconsider if they ever truly realized what they'd be up against in the other corner.